According to Federal Highway Administration statistics, 799 motor vehicle drivers, passengers, bicyclists, and pedestrians were killed in work zone crashes in 2017, which includes 132 highway workers. Reducing those fatalities is the purpose behind National Work Zone Awareness Week, which is being held April 8-12 this year. The FHWA, the American Association of State Highway and Transportation Officials, the Virginia Department of Transportation, the Maryland Department of Transportation, and the District Department of Transportation – along with other government agencies and trade groups – are sponsoring this year’s work zone awareness campaign. The campaign’s national kick-off event will take place on April 9 at 11 a.m. in Washington, D.C., at the Frederick Douglass Memorial Bridge. Hosted by the DDOT, the event will feature remarks from DDOT Director Jeff Marootian and FHWA Deputy Administrator Brandye Hendrickson. State departments of transportation are also launching work zone safety campaigns of their own. The Oklahoma Department of Transportation, for example, is using a “Game of Cones” theme as part of its work zone safety outreach effort this year. The Texas Department of Transportation is using orange ribbon symbols to highlight the importance of work zone safety. And the Michigan Department of Transportation is hosting its own work zone safety kickoff event on April 9 in conjunction with other state agencies such as the Michigan State Police and Michigan Occupational Safety and Health Administration. Plan ahead: Always research your route before you hit the road and check for upcoming work zones. When possible, avoid them completely by using any marked detours that are available. Move early into open lanes: When approaching lane closures, move into the open lane as soon as possible. Be sure to pay close attention to vehicles around you that could be in your blind spot. Note that traffic patterns can change rapidly, and drivers should always follow signs and direction from flaggers. 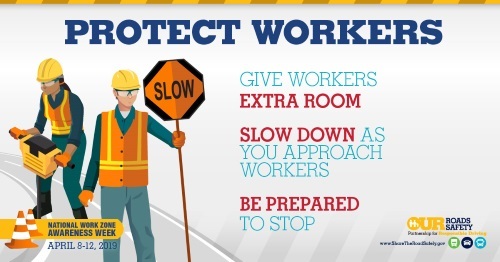 Watch for workers: Safety for crews in work zones, as well as the vehicles that travel through them, is critically important. Drivers must be on watch for workers coming in and out of work zones, including flaggers who may be directing traffic patterns. Go slow for safety: Stay alert and be on the lookout for upcoming work zones. As you approach one, slow down and pay attention to signs guiding traffic. Reduced speeds and sudden stops are common, be prepared to stop unexpectedly. Note that fines for speeding in work zones are often doubled. Maintain safe distance: Rear-end crashes are extremely common in work zones. Maintain a safe distance from other vehicles and never tailgate. Make sure to give trucks and buses plenty of space to merge during lane changes and avoid lingering in blind spots.